Lawmakers are optimistic bills to implement bipartisan commission's 2014 recommendations will advance after years of delay. After years of inaction, Maine may finally deal with the impacts of climate change along the coast, including ocean acidification, a byproduct of global warming that represents a potentially catastrophic threat to Maine’s marine harvesters. 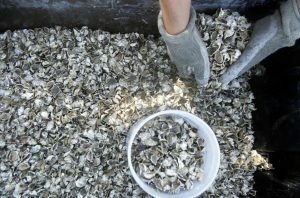 More than four years ago, a bipartisan panel of experts convened by the Legislature issued a series of recommendations for Maine policymakers to respond to the acidification in the Gulf of Maine, which weakens clams and other shell-building animals and has been implicated in die-offs at mussel farms and oyster hatcheries. Despite dire warnings from scientists, clammers and hatchery owners, Republican legislative leaders and the administration of former Gov. Paul LePage declined to take substantive action. But lawmakers in the new Democratic majority say they are moving to make up for lost time on this and other climate-related challenges to the Gulf of Maine, which has been the second fastest-warming part of the world ocean for the better part of the past two decades. The moves come amid a flood of worrying climate news, including a study released Thursday in the journal Science that found the oceans are warming 40 percent faster than a United Nations panel estimated just five years ago, and a report issued Tuesday that found U.S. carbon emissions had increased for the first time in three years. Cory McDonald pulls lobster out of a trap while fishing off the coast of Stonington on September 5, 2015. Over the past two decades, the lobster population in the Gulf of Maine has doubled to 250 million adult lobsters, even as the lobster catch has tripled. Robert Steneck, a lobster researcher at the University of Maine’s Darling Marine Center, believes the lobster population has boomed because a primary predator of lobster, cod, has been decimated in the Gulf of Maine. Much of the optimism stems from Gov. Janet Mills’ Jan. 2 inaugural address, in which the first policy issues she raised were the impacts of climate change on Maine’s ocean and forests. “Our coastal waters are growing acidic: temperatures are fluctuating, and sea levels are rising, endangering our shellfish industry,” she said. “Climate change is threatening our jobs, damaging our health and attacking our historic relationship to the land and sea. Democrats also now control both houses of the Legislature and no longer must persuade climate change skeptics in the Republican caucus to take action. Devin has introduced a bill that would ask voters to approve a $10 million bond issue to finance one of the ocean acidification panel’s top recommendations: targeted data collection, monitoring, and assessments of the impact on wildlife and commercial fish species. A second Blume bill would establish a Coastal Risks and Hazards Commission to identify physical – rather than ecological – threats to Maine’s coast, like those resulting from sea level rise and more intensive storm activity. The commission is modeled after one already created in New Hampshire and received legislative approval last session before being vetoed by then-Gov. LePage. Gulf of Maine sea surface temperatures in 2018 ran 2.8 degrees Fahrenheit above normal, making it the third warmest year in the 37-year satellite record and triggering the starvation of puffin chicks off the Maine coast, mass strandings of sea turtles in Massachusetts, and renewed concerns about the survival of endangered right whales. The only warmer years were 2012 and 2016. The Gulf of Maine is experiencing rapid warming in part because it is vulnerable to shifts in the relative strength of the frigid Labrador Current – which normally feeds the gulf – and the warm-water Gulf Stream, which can intrude when the cold current weakens. The Labrador Current is feared to be weakening as a side effect of the melting of the Greenland ice sheet, resulting in warmer water flowing into the gulf. 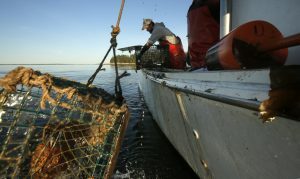 Nick Ports scoops up oyster seeds aboard a raft off the coast of Yarmouth operated by Basket Island Oyster Co. on September 17, 2015. 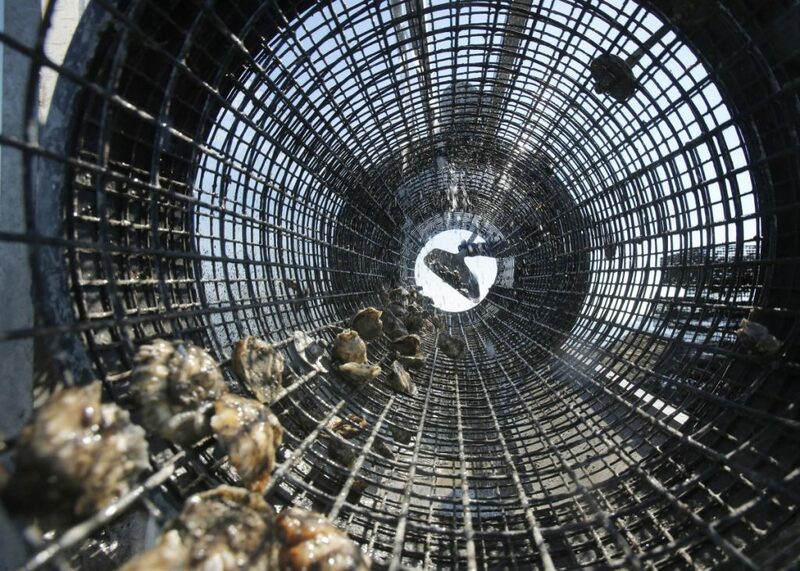 Increased acidfication in the Gulf of Maine has made it necessary to raise oysters from larvae to seeds in hatcheries because the acidity dissolves the shells the larvae develop. The effects for the Gulf of Maine can be dramatic for human and marine life alike. The 2012 “ocean heat wave” caused lobsters to shed six weeks ahead of their usual schedule, throwing off the timing of Maine’s soft-shell harvest and leading to conflicts with New Brunswick fishermen over access to Canadian lobster processing facilities. The population of green crabs exploded, and they devoured most of the clams in Freeport, Brunswick and other towns, tearing up seagrass beds in many bays. Ocean acidification compounds the dangers to Maine’s shellfish-dependent fisheries and aquaculture sectors. The problem is tied to the increased carbon dioxide levels in the Earth’s atmosphere, which are more than 70 percent higher than they were before the Industrial Revolution and now stand at the highest level in at least 800,000 years. The levels would be worse but for the fact that the oceans absorb some of that additional CO2, but that’s caused them to become 30 percent more acidic over this period, conditions that interfere with the chemical processes by which clams, oysters and other organisms grow their shells. Under President Trump, the federal government has also shied away from substantive action on these issues, and the United States has pulled out of the Paris climate change accord, the primary mechanism by which the world’s nations have tried to respond. In April, U.S. Sens. Susan Collins and Angus King of Maine wrote to the head of the National Oceanic and Atmospheric Administration, Tim Gallaudet, urging his agency to enhance monitoring of the subsurface conditions affecting the Gulf of Maine, which they said was “critical not just for Maine and New England states but for our country as a whole.” NOAA responded with a description of the status quo, suggesting the Trump administration did not intend to increase monitoring resources. For more than three years, congressional leaders failed to schedule a hearing on a bipartisan bill introduced by Maine Rep. Chellie Pingree, D-1st District, and co-sponsored by then-Rep. Bruce Poliquin, R-2nd District, that would have directed NOAA to assess the likely impacts of acidification on coastal communities and identify gaps in knowledge. Pingree has said she intends to reintroduce the bill now that the U.S. House is under Democratic control.